Artist's illustration of a future moon base. Synthetic organisms could help astronauts produce food and fuel. When packing for a manned mission to Mars or the moon, thebest thing to bring may not be food or fuel, but specially designed organismsthat can create those things for you. Scientists are researching the possibility of engineering syntheticorganisms that would use the resources available in the solar system to createthe supplies astronauts would need to surviveon another planet. "Personally I'm interested in space settlement,"said John Cumbers, a graduate student at NASA's Ames Research Center in MoffettField, Calif., who is researching synthetic microbes. "I think we have two choices: We can either go into space and be livinginside a tin can, or we can be going into space and recreating in space some ofthe beauty of nature we have here on Earth." "I think there's a lot that we can do that?s productivewith biology without having to release organisms in an unplanned fashion,"Cumbers told Astrobiology Magazine. Even with careful planning, this concept could bring risks,as some experts warn against creating "Frankenlife" that could becomean invasive species with unintended consequences for humans or the alien environment,including any native life. However, other scientists advise reining in fears. "I don't think this would be particularlyhazardous," said Chris McKay, a planetary scientist at Ames who is notinvolved in Cumbers' project. "The sort of organisms that would be good atdoing mineral extraction ? acidophiles, for example -- are not the type oforganisms that cause disease." And, he said, these syntheticorganisms would present no more risk of contaminating the search for alienlife than would the normal microbes being carried by humans and spacecraft. "In any case, we will have to learn how to tell thedifference between contamination from Earth and alien life," McKay said. To design an organism for use on another planet, researcherswant to mix and match desired qualities from multiple species. For example,they might start with a species that can do something useful, such as ?processingmaterials into biofuels or food. But this species might not be fit for a harsh environmentsuch as on the surface of Mars, where there is no atmosphere to block harmfulultraviolet radiation, and where temperatures can reach frigid depths. To fix that problem, researchers might want to give thatorganism genes from extremophilelife ? species on Earth that are adapted to extreme environments and arewell-suited to tolerate cold and resist UV radiation. Scientists have already achieved some successes in thisquest. Cumbers described an experiment in which researchers geneticallyengineered an E. coli bacterium to survive at lower temperatures than itnormally does. They accomplished this by transferring into an E. coli cell thegenes from a chaperone from a cold-tolerant organism found in sea ice. Achaperone is a protein that helps other proteins to fold correctly. One goal that could prove useful for space exploration iscreating a synthetic version of spirulina, a dietary supplement made frommicroscopic algae produced by cyanobacteria. Spirulina is a complete protein,meaning it contains all of the essential amino acids humans need in their diet.That makes it an ideal food to bring on a space mission. But spirulina generally grows in open ponds in the warmwaters of Hawaii ? so adapting it to life on, say, the moon is an engineeringchallenge. One reason bioengineered organisms are so appealing forspace travel is that they could open up a lot of room in astronauts' suitcases.The more supplies space travelers can produce once they arrive at theirdestination, the less they have to pack on the spacecraft. 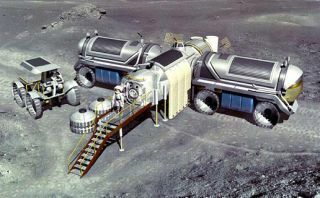 "For manned missions to the moon or Mars we're going tohave to take nearly everything with us, at least at the beginning,"Cumbers said. "If we have this new technology where we can take thecomplete genome of an organism and send it into space ? and can have thatsingle cell replicate from the resources it finds around it rather thanresources we've taken with us ? then we've started to tackle the problem." Cumbers presented his work with Lynn Rothschild, his adviserat Ames, at the Astrobiology Science Conference in League City, Texas, inApril. Terraforming Mars, the Noble Experiment?